Maybe Brad Pitt could make a movie about trucking and get people interested in the industry, joked Eric Fuller, who became CEO this year of what you might call the family business, Chattanooga-based U.S. Xpress, one of the U.S.’s largest trucking companies. “It’s definitely not that glamorous kind of lifestyle that I think it was 30-some-odd years ago,” Fuller said. Fuller made that observation recently as he discussed opportunities and challenges he sees for U.S. Xpress during an interview at the company’s headquarters — a sleek, metallic-gray landmark of a building on a hillside next to Interstate 75 in Ooltewah, Tenn.
U.S. Xpress has $1.5 billion in annual revenue and roughly 7,000 truck drivers. It hauls freight for customers that are household names, the largest clients being Walmart and Amazon. Despite the challenge of recruiting enough drivers, Fuller is excited about a Dec. 18 federal mandate that will require all long-haul trucks to use electronic logging devices (ELDs). That should benefit U.S. Xpress and other large trucking companies that already have implemented the technology, he said, and it may push smaller players out of the trucking business. “It’s really a big, big, big moment,” Fuller said of the end of paper logs, since ELDs will put an end to solo truckers bending the rules and exceeding their daily maximum legal limit on driving of around 450 to 500 miles. And U.S. Xpress should be able to pick up business, he said, as smaller companies decide they can’t make a go of it anymore because of the ELD mandate. U.S. Xpress last week reached a deal to spend more than $200 million to buy 1,400 International LT semi-tractor sleeper trucks and 265 day cabs from Navistar International Corp. But the biggest challenge for U.S. Xpress and others in long-haul trucking business is finding and keeping drivers, Fuller said. Long-haul truck diving is hard work and keeps drivers away from their homes and families for weeks. In the old days, people who got into the trucking business usually knew a relative or friend who was in the business, Fuller said. “Nowadays, we have people coming to us that are completely green,” he says. Employees’ priorities are different, too, now, he said. People used to build their life around their job. 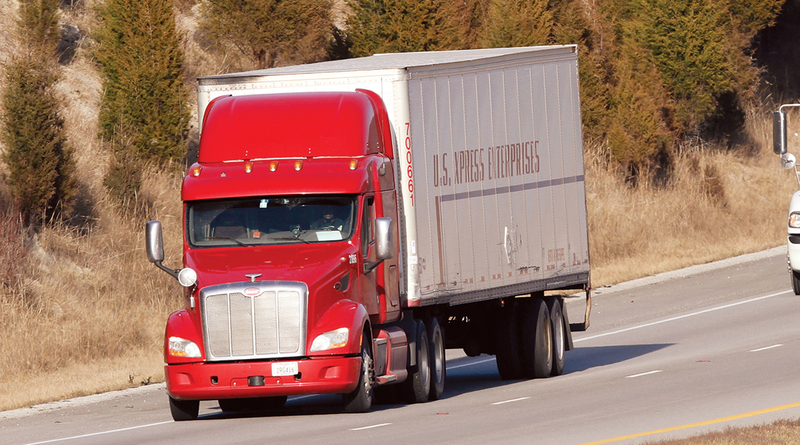 So U.S. Xpress has worked to make long-haul trucking more pleasant. Nice beds and cabins with standing room are some of the features that U.S. Xpress pays attention to when it buys new rigs. “We always look at the creature comforts and what we can do for our drivers,” Fuller said. U.S. Xpress has adopted a “Save 17” initiative that borrows the last two digits of the current year and is meant to focus on retaining 17 drivers a week who might jump ship for another company. Fuller sees the ELD mandate as an opportunity to make things better for U.S. Xpress drivers. That should let U.S. Xpress “optimize” routes, Fuller said, in such a way as to route drivers through their hometown more often during their stint on the road. “[We’ll try] to get you back a couple times during those couple weeks,” he says. Eric Fuller was 40 when he was named CEO this year. He has been the company’s president and chief operating officer for five years. Simultaneous to Fuller’s promotion, the trucking company’s board of directors also promoted Lisa Quinn Pate to president. The moves are a generational shift as their fathers, Max Fuller and Pat Quinn, were U.S. Xpress founders more than 30 years ago. Max Fuller, who was CEO, stays involved in the privately held business as executive chairman. “We’re fortunate to be mentored by him on a daily basis,” Pate says. Eric Fuller said he’s excited about the direction of Chattanooga and its focus on innovation and technology.